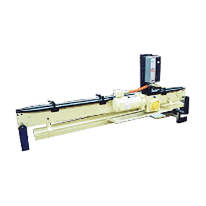 Model 1650 Thru-Feed Conveyor with Roller Chain is designed and built around two specific applications 1) forging and 2) induction hardening; however it can be utilized in many other applications. Forging applications are extremely rough and abrasive as are the billets that need to be conveyed, and Feedall’s roller chain conveyors are designed to handle these tough conditions. Conveys shock absorber shafts between two induction heat treaters.